DataViz, Inc., a leading provider of Microsoft Office compatibility solutions, on Friday (10/22/10) announced the immediate availability of Documents To Go 3.0 in the Android Market and through www.dataviz.com. Documents To Go continues to be one of the top selling productivity applications in the Android market as well as one of the top downloads with its free “view only” edition. 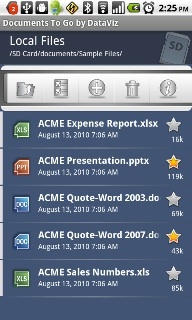 What’s New in Documents To Go 3.0 for Android? DataViz continues to offer both paid and free versions of Documents To Go, both of which have been updated significantly in version 3.0. While the free version remains limited in its capabilities, it now adds the ability to view PowerPoint files, which was originally in the paid version only. In addition, the free application is now ad-based. Once the Full Version key is purchased, the advanced features become available, and the ads disappear. Version 3.0 also offers a desktop application that provides Windows customers with the ability to easily transfer files from their computer to their Android-based device over a USB cable. Users can then select individual files or entire folders to synchronize and all updates made in either location will be automatically synchronized. As always with Documents To Go, 100% of the original file formatting will be maintained via DataViz’s acclaimed InTact Technology™. 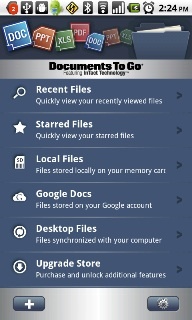 Documents To Go 3.0 has added tools to browse and manage files on an Android device. Mobile workers can now view, edit, create, delete, rename, sort, filter, star, sync, backup and send files from one centralized application. 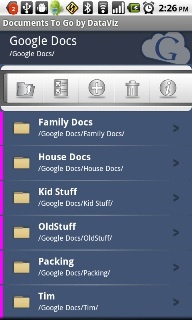 ‘Live Folders’ continue to keep recently used and favorite files in a conveniently accessible location. PDF To Go now includes pinch to zoom, multi-touch, rotate page and more. Rendering speed and quality improvements were made to Slideshow To Go. In addition, Office 2007 password protected files are now supported.